Ecology, behavior, and management of mammals with an emphasis on carnivores; applied landscape ecology; forest wildlife management; decision analysis. I like solving problems. A primary challenge in both wildlife conservation and the science that informs it is discerning just what problems need to be solved. This is not a trivial challenge; unless it is addressed well then research has little value to management. Working with wildlife managers, I commonly use structured decision making to develop shared understanding of management challenges and critical uncertainties that can be addressed through research. When designing studies to address these uncertainties, of necessity I am flexible on research subjects and methodological approaches—I am more interested in the problem solving than in taxonomic or technical particulars. Thus, my work tends to span a variety of questions, species, and methodologies—encompassing carnivores, ungulates, harvest management, disease, monitoring, genetics, and behavior. Although generally applied, my research is grounded in basic ecological, behavioral, and evolutionary theory. All of my research is also collaborative, working closely with state, federal, and tribal wildlife management agencies to address real-world conservation challenges. Investigate behavior, demography, management, and monitoring of gray wolves in the Northern Rocky Mountains. Estimate broad-scale vital rates for ungulates (elk, mule deer, moose) in the Pacific Northwest. Investigate cause-specific lamb mortality in Sierra Nevada bighorn sheep. Analyze optimal decisions using Structured Decision Making for management challenges. Learn more: carnivore and ungulate research. Develop and test a habitat suitability index (HSI) for black bears in the Southern Appalachians. Develop and apply models of optimal home range selection based on optimal selection of resource-bearing patches. Evaluate effects of forest management on food resources, home range behavior, and demography of black bears. 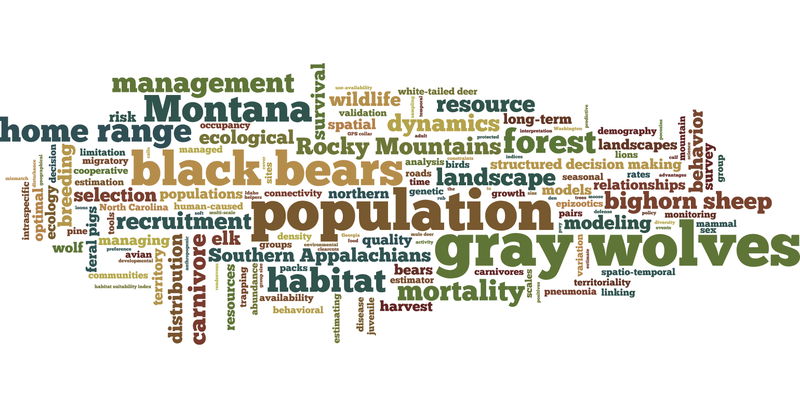 Model the long-term demography of a black bear population. Relate demographic trends of the bear population to limiting food resources. Identify trends for intensively monitored black bear populations in Idaho and Montana using genetic techniques. Understand effects of roads on behavior of black bears in Idaho. Understand transmission of disease within a linear population of bighorn sheep in Idaho. Model decisions for proactive management of disease outbreak for bighorn sheep in Montana. Understand effects of harvest strategies on habitat selection and home ranges of white-tailed deer in Washington. Evaluate demography, habitat use, and home range behavior of a feral pig population and how they responded to control measures. Determine contribution of stand- and landscape-scale habitat features to population dynamics of mice. Evaluate demographic responses of small mammals to fire and fires surrogate treatments. Evaluate effects of scale in determining landscape-scale associations between habitat and bird species. Develop a Multi-scale Spatial Analysis Tool for using landscape models to map probability of presence or probability of belonging to different richness classes for any forested landscape for which basic GIS data are available.